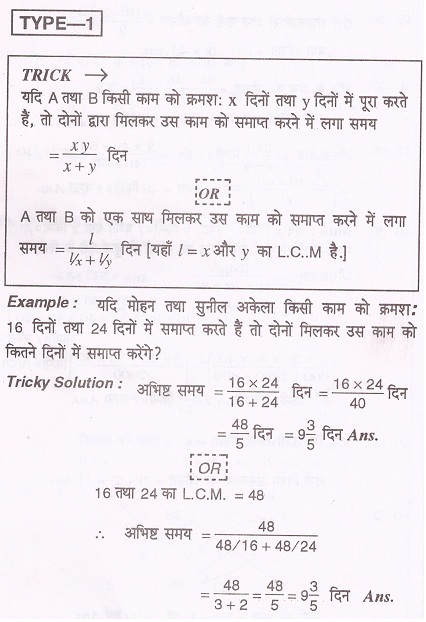 In this post we are going to share some most important short tricks of Time and work problem which is very important for those candidates who are appearing in the various competitive examination. 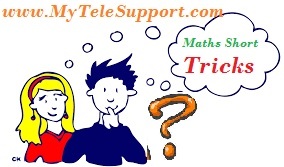 With the help of following tricks aspirants will able to solve numerical problems based on time and work. If A done a work in n days, then his work of one day = 1/n part. If work of one day of A is 1/n part, then to complete his full work he needs n days. If ratio of working people is X:Y, then ratio of time taken by them will be Y:X. If ratio of working capacity of A and B is a:b, then ratio of time to complete same work by them will be b:a. If A and B finish any work alone in sequentially X days and Y days, then time to complete that work together = XY / (X+Y) days. 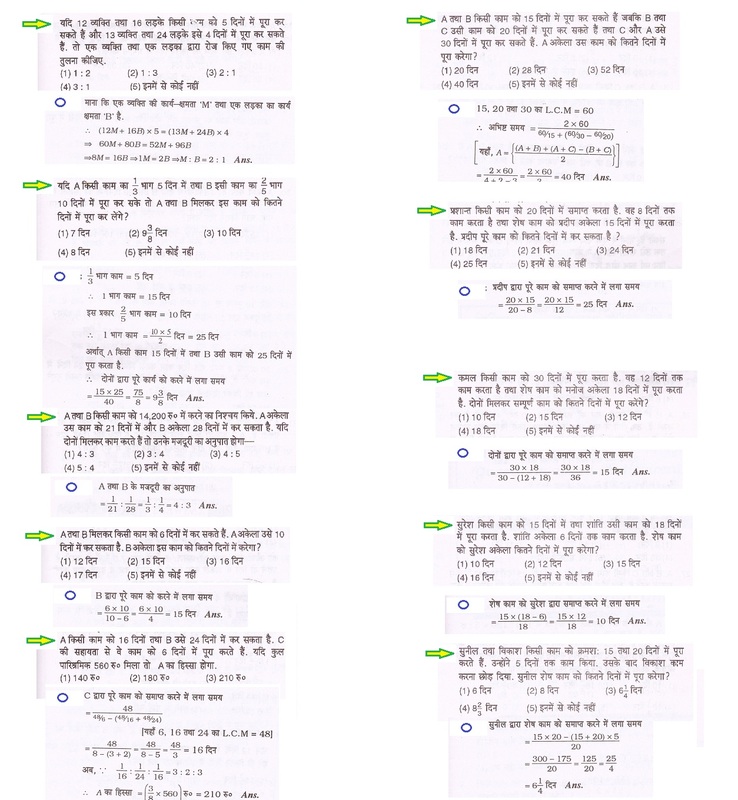 Example :- If Mohan and Sunil alone complete a work sequentially in 16 days and 24 days. then how much days did they need to complete that work together? A and B undertake to do a piece of work for Rs 600. A alone can do it-in 6 days while B alone can do it in 8 days. With the help of C, they finish it in 3 days. Find the share of each. B’s share = Rs. (600 x 3/8)= Rs. 225. C’s share = Rs. [600 — (300 + 225)] = Rs. 75. Now, 5/48 work is done by them in 1 day. 5/8 work is done by them in (48/5)x(5/8)= 6 days. If A, B and C finish any work alone in sequentially X days, Y days and Z days, then time to complete that work together = XYZ / (XY+YZ+ZX) days. 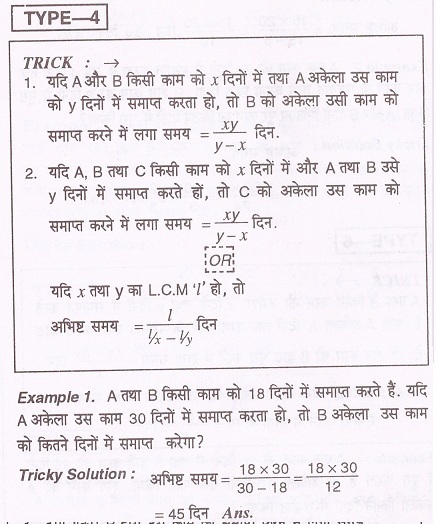 Example :- If A , B and C alone complete a work sequentially in 10 days , 15 days and 12 days. then how much days did they need to complete that work together? Example :- If (A+B) complete a work in 20 days, (B+C) complete that work in 24 days and (A+C) in 30 days, then in how much days did (A+B+C) will complete that work? 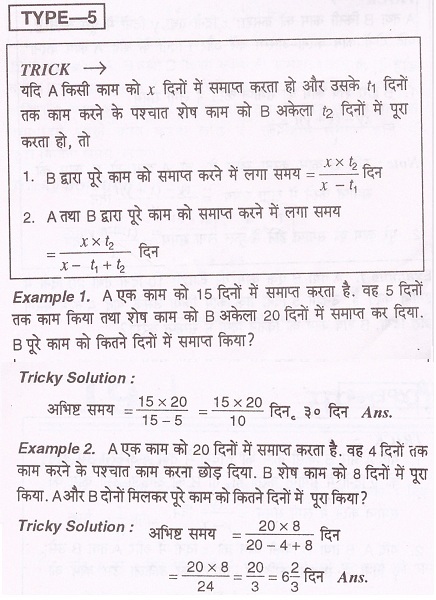 Example :- A and B complete a work in 18 days. If A alone complete that work in 30 days, then in how much time did B alone complete that work? Example :- A completes a work in 15 days. He works for 5 days and then B continues that work and complete it in 20 days. In how much time did B alone can complete the hole work? Example :- A completes a work in 20 days and B complete that work in 25 days , B work for only 10 days, in how much days did remaining work was completed by A? 1. 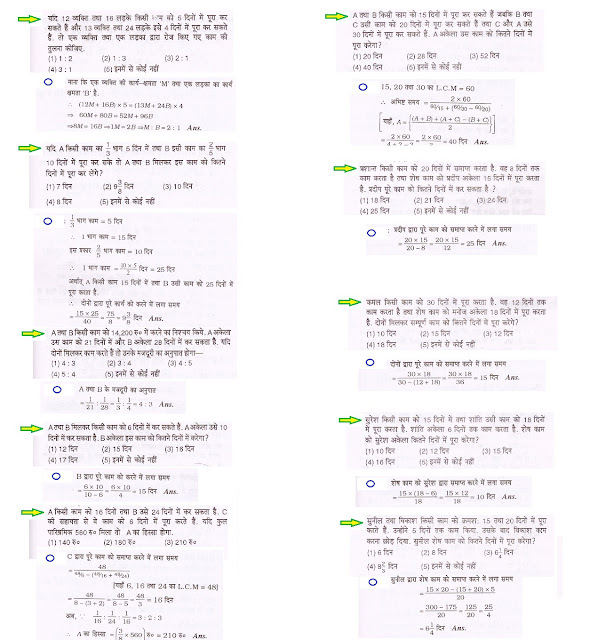 Time to complete the remaining work by B = XY - (X+Y)T / X days. Example :- A and B sequentially complete a work in 10 days and 20 days. They work for 5 days and after that A leave the work, In how much days did B completes the remaining work? Example :- A, B and C sequentially complete a work in 10 days, 15 days and 12 days. All of them together started the work, but A leaves the work after 1 day. In how much time did remaining work will be complete? Example :- A and B sequentially complete a work in 20 days and 30 days. Both started work together but A leaves the work before last 5 days of finishing the work, then in how much time total work will be complete? Example :- A, B and C sequentially complete a work in 15 days, 20 days and 12 days. If all three together started the work but, A leaves the work before last 5 days of finishing the work, then in how much time did work will be complete? Example :- A, B and C sequentially complete a work in 10 days, 15 days and 12 days. If all three together started the work but, A leave the work after 2 days of starting the work and B leaves before 1 days of finishing the work, then in how much time did total work will be complete?